A mixture of East and West, with its multiple and precious remains of Seljuk art, has a special charm. _ _ _ _ _ _ www.helloTURKEY.net' s mission is to give you as much detailed assistance before you visit KONYA. KONYA is located in the heart of the Anatolian plateau (Anadolu)... located 4 hrs. driving distance (158mi/260km) from capital city of Ankara to the south and it is one of Turkey's oldest continuously inhabited sites. Today it's population is 2 million as being as the capital of Konya Province . Konya was the capital of the Seljuk Turk Sultanate. Muslim mystic, philosopher and poet Jelaleddin Rumi ('Celaledin-i Rumi', in Turkish) is the Sultanate's most world-widefamous and enduring figure. Konya is known throughout the world as the home of the WHIRLING DERVISHES. In the 2nd millennium the Hittites named Konya as 'Kuwanna', then the Romans called it 'Iconium'; and finally the Turks named it 'Konya'. The city is very rich in Seljuk ('Selcuk' in Turkish) and Ottoman (Osmanli) history. From the 12th to the 13th century, KONYA was the capital of the SELJUK TURKS and one of the the greatest cultural center of ANATOLIA ('Anadolu' in Turkish). It was during this period that the Moslem mystic MEVLANA CELALEDIN (Jalaluddin) RUMI founded the sect of ' Whirling Dervishes'. ('Mevlana' means in Turkish 'Our Master'). Mevlana Celaledin (Jalaluddin) Rumi was born in the town of BALKH (1207-1273), in Khurasan (near Mazar-I-Sharif in Afghanistan, then in 1228 he settled in Konya. 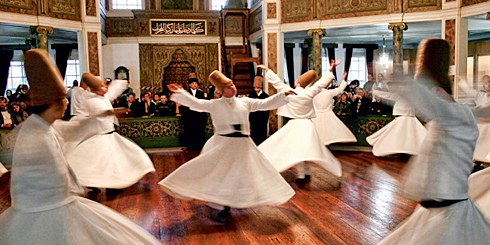 After his death(1273), his disciples founded an Sufi order by his son(Veled) which became known in the West as the Whirling Dervishes, who sought to achieve ecstasy and unity with God through controlled trance-like spinning. MEVLANA teachings expressed that love is the path to spiritual growth and insight. Broadly tolerant of all people and other faiths. The most famous building in Konya is the Green Mausoleum of Mevlana Celaleddin(Jalaluddin) Rumi. The former dervish seminary attached to the mausoleum is now a museum devoted to manuscripts of Mevlana's works and various accoutrements of the sect. The mausoleum continues to draw pilgrims from all parts of the Moslem and non-Moslem world, mainly because, although Mevlana was a philosopher and mystic of Islam, he was not a Moslem of the Orthodox type. While he was a devout Moslem, his doctrine advocates unlimited tolerance, positive reasoning, goodness, charity and awareness through love. To him and to his disciples all religions are more or less truth. Looking with the same eye on Moslem, Jew and Christian alike, his peaceful and tolerant teaching has appealed to men of all sects and creeds. Mevlana was a teacher who influenced the whole world of Islam, and philosophical thinking throughout the developed world. The impression he left behind can not be erased. Indeed, the concepts he taught continue to shape the lives, either directly or indirectly of many people in generations. Every year in December 17th, ceremonies are held in Konya or the commemoration of Mevlana (anniversary of his death) and the Whirling Dervishes. During festival, the Sema dance is performed by men dressed in white robes, whirling and rotating around the floor. This dance, in which the dancer with the great love of God (Allah) is believed to attain divine unity, is an event well worth seeing. don't miss visiting all these historical treasures! which are fine 13th century monuments built during the reign of the famous Seljuk Sultan Aladdin Keykubat. Museum located on Aladdin Hill. constructed in A.D. 1251 and stands to the north of Aladdin Hill, and is now a museum which holds the best examples of Seljuk tiles and ceramics. Built during the reign of the Seljuk ruler Izzeddin Keykavus II by the Vezir Sahip Ata Fahrettin as a medrese, it became a public museum in 50's. It houses wooden and stone works of the Seljuk period. A medresse with an open courtyard, it was built in 1242. There are tombstones of artistic value from the Seljuk, Beylik, and Ottoman periods. >Built in 1912, this house was presented to Atatürk by the people of Konya in 1928, and opened to the public as a museum in 1964. Clothing, personal belongings, photographs, and documents are on display. Articles on display are from the Neolithic, pre-Bronze, Hittite, Phrygian, Greek, Roman, and Byzantine periods. Also exhibited are findings from Çatalhöyük, Erbaba, Sizma, Karahüyük, and the Aladdin Hill. Built on the Aladdin Hill, it is the oldest historical building in Konya of the Seljuk period. Located near the mausoleum of Mevlana, it is a beautiful example of classical Ottoman architecture. The construction began during the prince hood of Sultan Selim II when he was governor of Konya in 1558, and it was finished in 1587. This museum is a gallery of natural history where stuffed birds and animals are displayed, and galleries of carpets and kilims, coins, and manuscripts. The museum also has a library of 20000 volumes. Turkey is a land that offers many vacation attractions and shopping is fun part of this of course. A country such a varied history of different cultures and civilizations, is bound to have a rich antiques and handcrafts marketplace. ÇAY prepared in a special way, by brewing it over boiling water and served in delicate, tullip shape small clear glasses to show it's deep red color and to keep it hot. On the other side; Turkish coffee (KAHVE) mostly drink by the adult person... this mean, almost not seen drink by kids. Also Turkish coffee is not used as a drink for breakfast or any other regular meal. Konya is Turkey's most conservative city. Tourists to be respected religious and social traditions to avoid offending local sensitivities. Islamic practices and beliefs are closely adhered to in the country's customs, laws, and regulations. Common sense and discretion should be exercised in dress and behavior. Visitors should dress conservatively (i.e. women should cover their heads with a scarf and also cover their arms and legs). Business dress is the same as in Europe or North America, although women are advised to wear business suits with regular skirts (below the knee), to avoid any misunderstandings.